Pioneer Electronics (USA) Inc. Professional Sound and Visual Division continues to help enhance DJ performances with the introduction of the DDJ-SP1 sub-controller. Designed for Serato® software users, specifically for “Serato DJ,” the DDJ-SP1 is a slim and compact sub-controller that uses multiple performance pads, controls, buttons, and knobs to trigger a variety of unique audio samples and effects. The DDJ-SP1 is designed to be the ideal companion to Pioneer’s new DJM-900SRT mixer but can also be matched with other systems via its MIDI controller functionality. 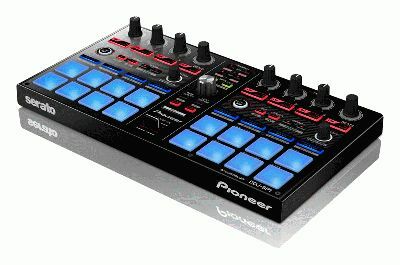 The DDJ-SP1’s built-in pads, faders, knobs and buttons closely mimic the control layout of Pioneer’s well-received DDJ-SX controller. · Performance Pads – Pioneer added 16 “performance pads” on the sub-controller for seven different functionalities: hot loop, auto loop, manual loop, hot cue, roll, slicer and sampler. It also includes a “Velocity Mode” function that determines the output volume of the sample based on how hard the pads are struck. Each pad can be assigned as a hot cue point, and its blue illumination will signify its state of play for instant graphic feedback. · Sampler Volume Fader – In between the performance pads is a volume slider to control output of the trigger pads. The convenient location of the slider enables quick volume adjustment during finger drum performances. · Slip Mode – Pioneer included a Slip Mode function that enables continuous music playback in the background even when loops and hot cues are being performed. The functionality can also be used with players and controllers that support Serato DJ but not Slip Mode. · FX Knobs/Buttons – The integrated knobs and buttons are arranged for Serato DJ software for operation of iZotope® effects. · The sub-controller includes a free of charge download of Serato Video (valued at more than $100), a video control plug-in compatible with Serato DJ, Scratch Live and ITCH, that makes it extremely easy for users to insert video, effects and image files with music. · USB connectivity and charging. · DDJ-SP1 can be mounted on the X-Stand (T-U101), Pioneer’s portable DJ stand (sold separately). · Compact (12.9” x 7” x 1.8”) and weighs only three pounds, for easy transportation.